I thank my husband for unknowingly inspiring the creation of this recipe. One day while he was at work he emailed me this link to a resort in Mexico. Suddenly I was whisked away in a day-dream, sitting on a beach with warm sand on my toes while sipping a Piña Colada. Before I knew it, the strawberry shortcakes I had planned for dessert that night morphed into this tropical version in my head. 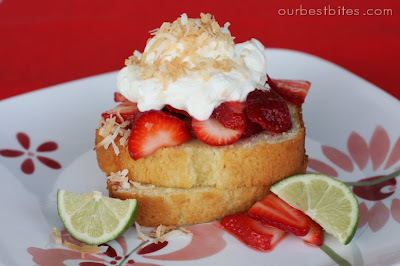 I love lime and coconut together, and I love strawberry shortcake (who doesn’t?) So this was the perfect combo to me. It got rave reviews from my official taste-test crew (my husband, my son, and my sister) so I thought I’d share it with you all as well. It’s super easy and it’s a fun variation on a classic that everyone loves. Perfect for warm summer days! 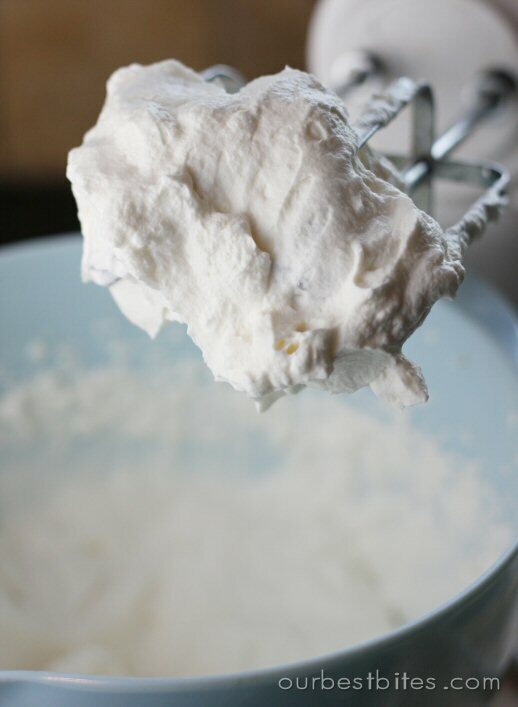 And you can’t have strawberry shortcake without whipped cream so while the berries are sitting, whip up your cream. The secret to this version is that it is not only and sweetened with sugar and vanilla, but coconut extract too! Now just layer all of the ingredients onto either store-bought or homemade angel food or pound cake and ta-da! 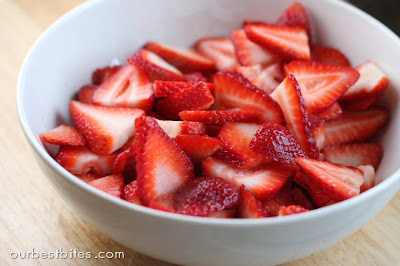 The yummiest twist on strawberry shortcake you’ll ever have. Mix sliced strawberries, sugar, and lime juice. Stir well and set aside. Stir occasionally over about 15 minutes. You want the sugar to dissolve and form a light syrup. Slice cake and spoon a layer of strawberries on top. 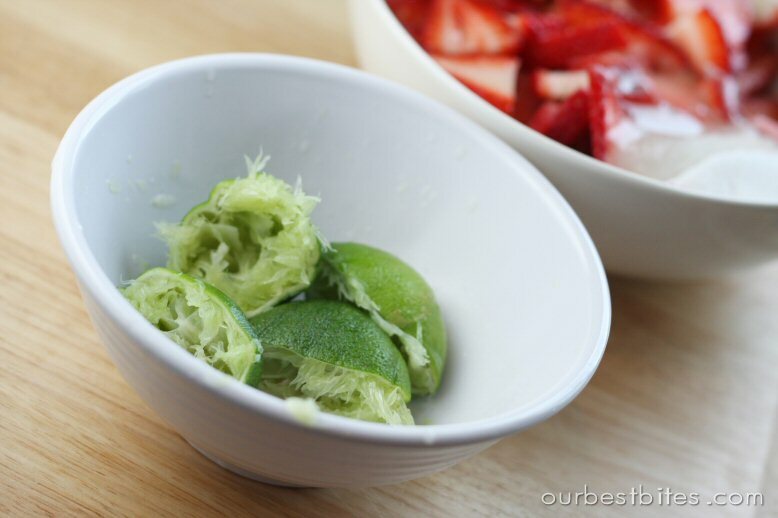 Include the lime-syrup! Top with a generous dollop of whipped cream and sprinkle with coconut. This serves about six, but it could be more or less depending on how what size you make them. Mmmmmm I can officially say this is the best strawberry shortcake you will ever taste! Come back and tell us how you like it, okay? Glad you stumbled across us! You made my day! I’ve been waiting for this recipe. Now off to buy some strawberries…. I’ll have you know my mother called me and said, “So do you guys want to come over for dinner? 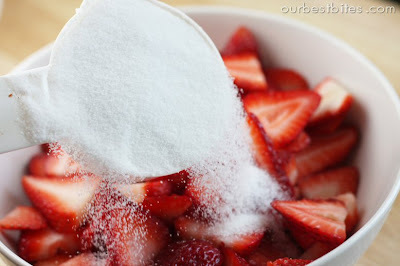 For dessert I’m making strawberry shortcake that’s on The Daily Bite.” You guys are a hit! I’m proud to call you my friends. lol. Hahaha, Carly! 🙂 Thanks, Carly’s mom! 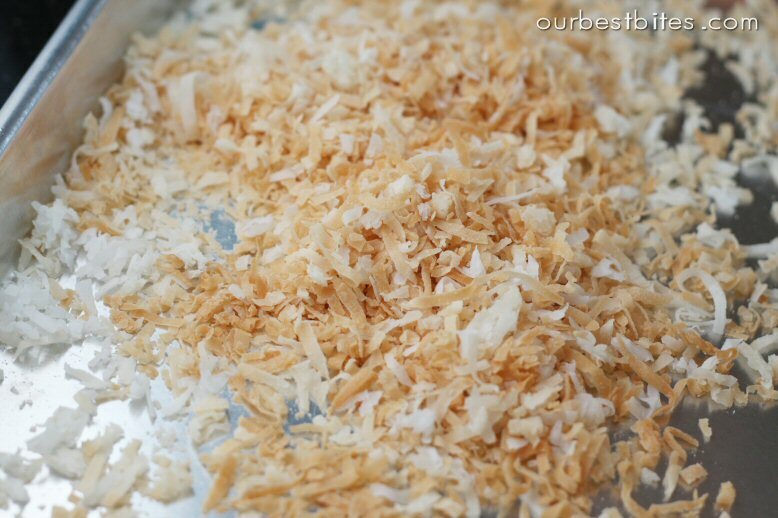 I’m feeling a moment of inspiration here… Kate, you should make coconut ice cream and put it on the strawberry shortcakes…mmmm. It was delish Sara!!! Thanks! Your presentations are beautiful!! Unfortunately with our busy schedules with base/softball I haven’t had much time to cook, but I love checking your blog out! So imformative. I found your blog through Rhead & Write (I think). Just wanted to say I enjoy your receipe selection and step by step pictures and guidelines. So thank you! Eve, are you a friend of Daryl’s? This looks like it will be amazing! I can’t wait to try it! I love The Daily Bite! You guys are the greatest! Just needed to add that I’ve actually been to that place in Cabo. Funny, I remember a lot more people there that weren’t as “pretty”. Thank you for this site! I’m a huge baker, but need some help making things that don’t include butter, chocolate chips, brown sugar, etc. Love you Sara! Yum! My SIL just visited from Colorado, and we had a whole conversation about our favorite "Our Best Bites" recipes! Thanks for all of the work you put into this great blog! i had 5 boys in my living room that needed re-directing to the great outdoors, but i was going to "quickly" print out a couple of your recipes before i shooed them out. btw, i have NEVER in my internet life bookmarked so many pages on one website! Thank you AGAIN! p.s. for my first time ever, also, i am sending info about your yummy site to all my friends! Lisa in texas- you're awesome! lol. I'm glad you're finding lots of yummy things to make, and thanks for sharing us with your friends! If you are making the RSS readers come to the site because of ad revenue, I'd much rather see an add in the RSS feed than have to come to the site. I use reader to save the recipes I like. Although that may not be possible in Blogger. If it is for another reason, I'd be open to hearing it. hmm…i wonder how this whipping cream would taste in a cup of coffee. i mean, since you'll likely have some leftover. yum! This is even better with the scones that were with the original recipe. Love it! Wow such a creative twist on an old favorite. I love lime and coconut together and I'm sure they go perfectly with the strawberry coconut. Can't wait to try this one out! 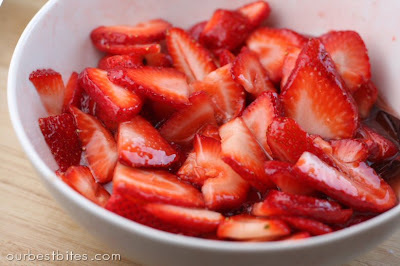 Funny enough, Strawberry Shortcake was on the menu last night and I made a couple last minute changes to morph it into this A-MAZ-ING dessert. I will never make plain ol' Strawberry Shortcake again. It's back on the menu this weekend and I'm looking for other excuses to make it again!! Thanks for the response. Great reason too. I haven't been following for two years, and I'm glad I got to see yesterday's recipe. I appreciate being exposed to content I wouldn't otherwise have seen and you taking the time to respond. This is so good that I enjoyed it three times this week 🙂 Speaking from someone that usually require chocolatey desserts, that is saying a lot! Thanks for the awesome recipe. You gals are freaks of nature. Really. How do you come up with your ideas? I think there must be some different wiring going on in your brains. This is now my favorite cake!!!! Also the left over whip cream and coconut is amazing on fresh peaches. I think I need to implement a lot harder exercise routine, we can’t keep from cooking.